There are about 7.3 million Israelis in Israel and over 4 million citizens are eligible to vote at 7 a.m. when the polls open tomorrow. By 10 p.m. all the votes will be in for the big decision. Who will the Israelis choose to lead their country? Going to the polls tomorrow is very important. Who will lead this country and be responsible for its future. Israel, the only true democracy in the Middle East, will again have a chance to plant hope in its people. Binyamin Netanyahu and his right-wing Likud party are slightly ahead of Tzipi Livni from the left-wing Kadima party. Kadima is hoping to beat Likud and many in the center-left parties are likely to choose Kadima because choosing Livni is a way to stop Netanyahu. Right now in Israel, only Tzipi Livni can beat Netanyahu. Earlier, Livni received a vote of confidence from outgoing Prime Minister Ehud Olmert, who was ousted as party leader in part because of Livni’s efforts. Another very important election is upon us in just a matter of months. It will be very interesting to see how Israel’s is perceived; during and after the votes have been cast. 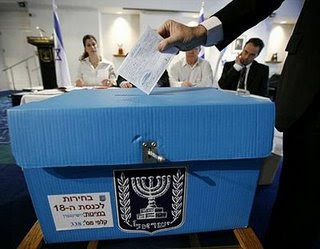 Results are expected around 2 a.m. in Israel.